Proper’s Famous Pickle Spears 32 oz. 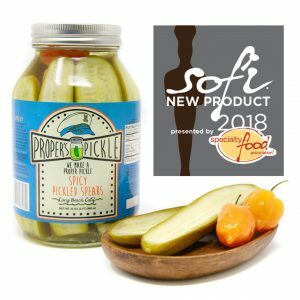 Home / Dill Pickles / Proper’s Famous Pickle Spears 32 oz. Regular jar not enough spear for ya? Get the amazing Proper’s spears in the jumbo 32 oz size. Exactly the same, just a whole lot more of them. El Grande! These are huge spears, so get ready for a vicious battle over them. The only complaint we have ever received about our 16 oz. spears is that the jar is only 16 ounces. Well ask and you shall receive. 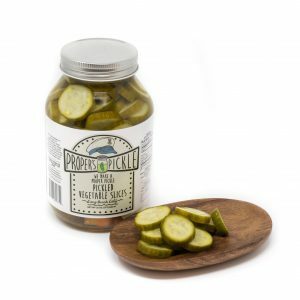 These are the big berthas of Proper’s Pickle. 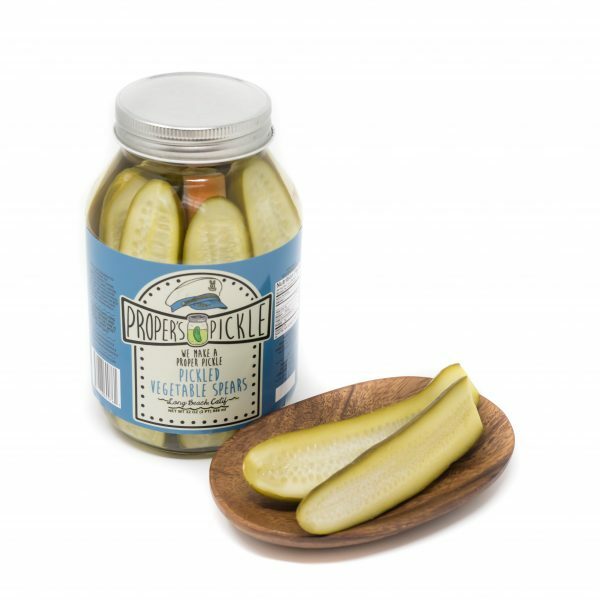 32 ounces of the most crunchy and delicious pickle spears you can find. We are messing around here people. This is what it is all about. 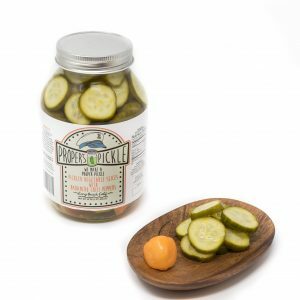 Made for the true pickle lover that has no problem sitting on the couch with a giant jar of pickles in their lap and a smile on their face. And now they are big enough to share. But if you love pickles enough to get this massive jar you probably won’t. And that’s okay with us. Make everyone else get their own. After all, they are your pickles. We cut our Persian Cucumbers with their delicate skin in long halves so you can just get right to the point of snacking on a pickle. We slice our carrots with their sweet ruggedness into battle ready javelins to help conquer that unique flavor that you love so much. And yes, we of course added our fresh sprig of dill and clove of garlic just as we do in every other bottle. Finished off with our simple refreshing brine of vinegar, water, and salt to give it that final touch that keeps you coming back for more. So if you feel like being a good person grab one of these bottles for the next party or bbq to share with all your friends and family. Or if you feel like spoiling yourself a bit strategically place them on the bottom shelf of the refrigerator behind that foil wrapped surprise that has been sitting there since the holidays. Nobody will ever look there. Proper’s Pickle Slices with Habanero Chili Peppers 32 oz. Proper’s Famous Pickle Slices 32oz.